The Strength & Conditioning Program at Farmington High School works with all sports teams in the athletic department. Our goal is to help develop the total athlete by training for maximum muscular power, speed, agility, and jumping ability. By training these areas, our athletes gain the physical tools necessary to make the plays on the field, court, ice, mat or in the pool. Optimum performance is achieved through optimum training. We are big believers in ground-based, multi-joint movements for athletes. There are three aspects to our training program. 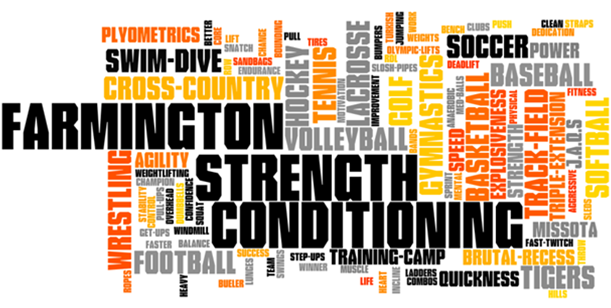 The Farmington Strength & Conditioning strength program (ESP) is a periodized program designed specifically for athletes. Multi-joint, ground-based movements are used to produce maximum gains muscular power and strength. This training is done in a sport-specific manner to help you perform at the highest level while competing. It stands for Jumping, Agility, Quickness and Speed, and our training program is designed to develop and improve these areas. These are the important sports performance factors that, when trained, can help the athlete get into position to make the play, while being under control. These workouts are generally done as a group, using tires, ropes, sleds, med balls, sandbags, slosh pipes, etc, to train aerobic power and muscle endurance. The name pretty accurately describes this hard but fun part of our program.